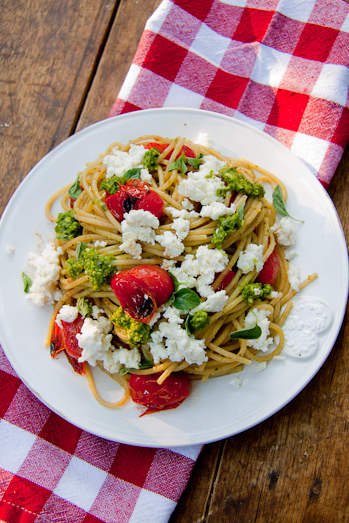 This pasta with roasted cherry tomatoes is the perfect meatless meal packed full of flavour. Balsamic roasted tomatoes, creamy ricotta and garlic-y pesto make this a memorable and healthy meal! 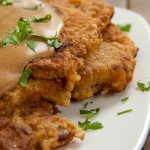 When I first started cooking meatless meals I thought constantly whether I would be able to do it once a week, I never though there was more than maybe 5 proper meal options. But it turned out that the more I cooked vegetarian food, the more ideas came to me. Most often, the ideas that come easiest are pasta dishes. It’s very easy to create a filling and delicious meal without meat when you have pasta as a base to work from. And so this pasta with roasted cherry tomatoes was born. It can be incredibly simple or really complicated but it’s very hard to go wrong with pasta. In Nigella’s new book “Kitchen”, she has a recipe for Marmite Spaghetti. It’s actually just Marmite, butter and spaghetti. Now, if that’s not simplicity at it’s finest, I don’t know what is. For me, garlic-buttered spaghetti is like Nigella’s Marmite Spaghetti. It’s immensely comforting and wonderful but sometimes, I need a bit more to my meal. In moments like that, I choose seasonal veg, beautiful herbs and luscious cheese to jazz up my plate of pasta. That’s exactly what I did with this dish. The key to making this pasta with roasted cherry tomatoes a success is using the absolute best ingredients you can find or afford. 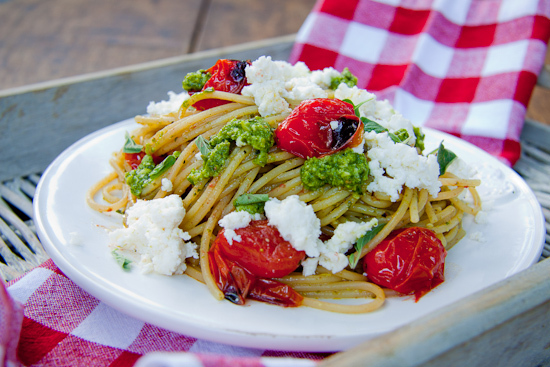 Sweet Cherry tomatoes roasted with a splash of Balsamic vinegar, fresh and creamy Ricotta cheese and packed-full-of-garlic basil pesto combined with Al Dente pasta makes one of my favourite meals, ever. Toss the cherry tomatoes with the vinegar, oil and seasonings and transfer to a roasting tray. Roast for 15-20 minutes until the tomatoes are blistered and the skin starts coming loose. Keep watching the tomatoes because the oven will be very hot and you don’t want them to burn. Meanwhile, cook the pasta in plenty of salted water until al dente. 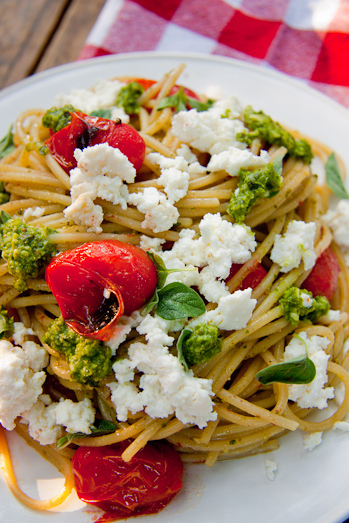 Drain and combine with the tomatoes (and all their pan juices), ricotta and basil pesto. Serve with extra Ricotta and basil pesto. What a lovely pasta dish! You are so right that you can’t go wrong with pasta and garlic! It’s so comforting! 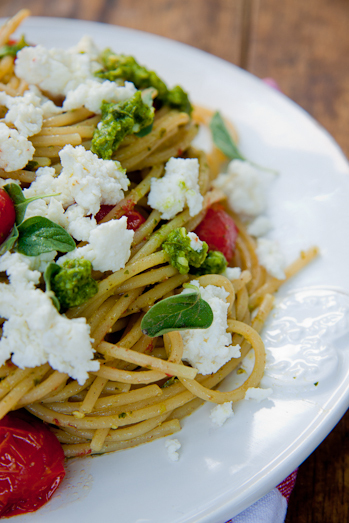 Love the use of the thinned basil pesto rather than just basil. Beautiful pics! Hi Ally, glad to find your space. You have got a great collection of vegetarian recipes. Loved the pasta recipe, quite tempting and healthy as well. A friend made this recipe at a dinner party I hosted, and all I can say is wow! 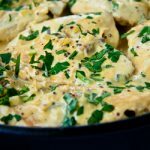 Between the bright colors and the robust flavors, it was a real hit and yet it was still quite simple to make. We paired it with red sangria, polenta, rosemary bread, and 3 varieties of bruschetta (eggplant, artichoke, and traditional). Jason, it is is one of those simple crowd pleasers, isn’t it? Glad you liked it! Tania, I’m so glad you liked it. I think people have a mis-conception about Vegetarian and Vegan food (although this isn’t Vegan because of the Ricotta), but it’s really something you can play around with and it forces you to be creative! LOVING the colors and flavors of this dish! Certainly includes a lot of my favorite things! Can’t wait to try this out! Mary: I just love all the bright colours and the freshness of the dish…hope you like it! Beautiful pictures! I love pasta. I’d eat it morning, noon, and night. Yum!